A group photograph of the QATB (Queensland Ambulance Transport Brigade) Hughenden branch committee, taken in 1988. Also part of this committee, but absent in this photograph was Drew Wescott. Handwritten on back: "Hughenden District Historical Society // No. P331"
Printed on back: "THIS PAPER // MANUFACTURED // BY // KODAK"
Printed on paper and adhered to front of photo: "Q.A.T.B. 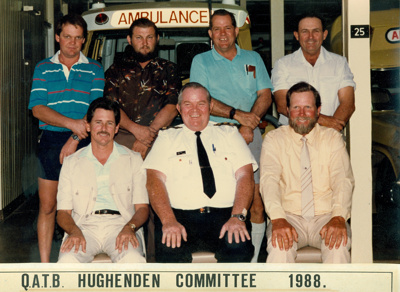 HUGHENDEN COMMITTEE 1988. // FRONT ROW - MILES CLARKSON, RON JAMES (SUPERINTENDENT), ALASTAIR ANDERSON, // BACK ROW - ROBERT JOHNSON, GEOF ROBINS, PAUL FRANZMANN, ALAN PAINE, // ABSENT - DREW WESCOTT // FLINDERS PHOTOGRAPHICS"